When it comes to buying Valentines Day gifts for your significant other, it's more important than ever to be creative and original with your ideas - especially if you want to make a big splash and earn brownie points. So this year, instead of the usual chocolates and flowers, why not treat the lady in your life to some stylish Valentines shoes.That's right, Valentines-themed trainers are a thing and we're fairly excited about it! At Parcel2Go, we are here to bring you the best and latest trends in online shopping, and this Valentine's Day, we've gone that extra mile and sourced what we think are the best love-themed trainers for her on the market. And let’s face it, trainers will last a lot longer than flowers! Firstly, we have the Adidas Stan Smith Valentines Day trainer for her. A classic stan smith trainer that has built-up a great reputation for being one of the most comfortable shoes on the high street. A minimalist trainer with an infectious red cut-out heart. 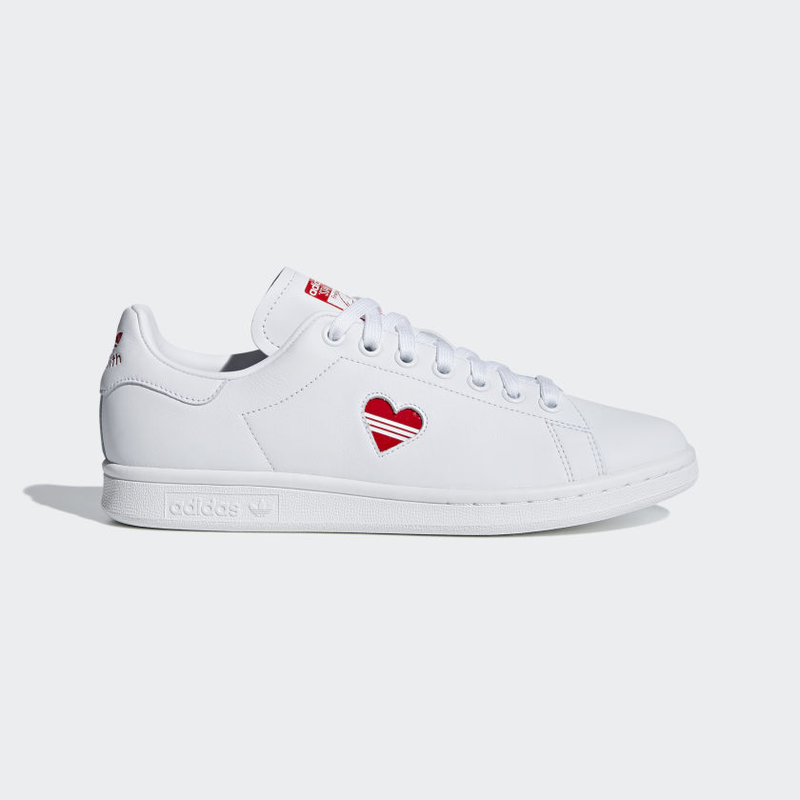 This trainer is consistent with past stan smith designs but with one clear difference, the Valentine’s Day heart. It is apparent on each of the shoes on the outer side, with the iconic Adidas three stripes running through it. If you are looking for subtly this Valentine’s Day, the stan smith is for you. A simple style, but incredibly stylish. 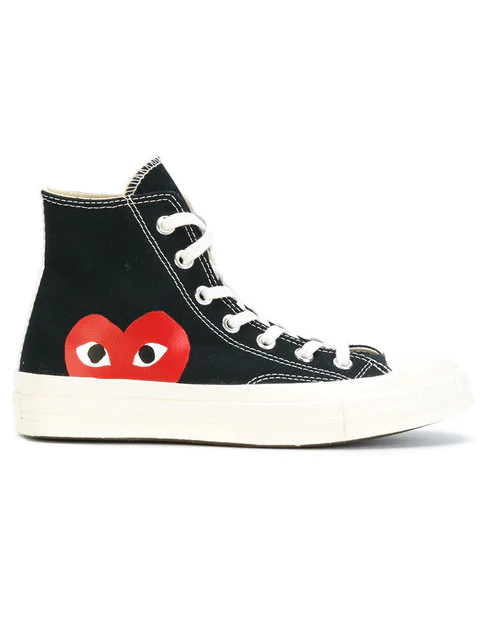 Our second shoe is the Comme Des Garcons Play x Converse High Top trainer. Known for its popularity among the fashion gurus, this elegant shoe is a must have statement piece for your girlfriend. The trainer offers prominent white stitching amongst the black cotton and has a thicker white sole than the standard Converse shoe. If you are tired of your old high tops and want to upgrade to a newer thicker shoe, this is the one for you. Although the cost is higher than the standard Converse, it’s the price you pay for the small details that really matter. A special trainer for that special someone. Next is a classic that we personally love, the Puma Heart shoes. A spin on one of the classic Puma Match trainer, adding a thick silk bow to the shoes creating the perfect Valentine’s Day gift for her. These fierce heart trainers present a new challenge for the person that wears them, you need confidence to rock them. A diverse trainer that comes in various colours and materials, suitable for all personalities. Complementing the minimal look is a white stripe embroidered onto the lateral side and inner side with the bronze Puma emblem sitting on the heel. These Puma shoes could be the perfect gift for that girl who likes to blur the lines this Valentine’s Day. 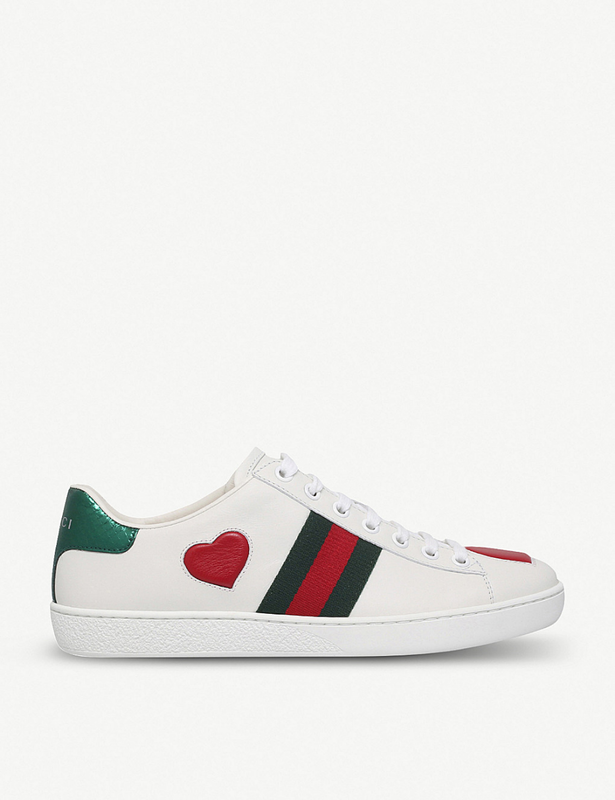 There has been a recent demand for the Gucci Ace trainers, a simplistic white shoe but with the traditional and eclectic reputation of Gucci. These heart-detailed leather trainers are really something special. Eccentric and colourful, Alessandro Michele has demonstrated the diversity of this trainer with iconic red hearts on the outer side and on the toe. These Valentine’s shoes for her are the perfect gift for a loved one this year. Not to forget, the shoes are crafted with Gucci’s signature web stripes showing its traditional style. If that special someone is eccentric and loves being ahead of the trends, these heart-detailed trainers will be perfect to strut their stuff. These trainers might be expensive, but can you really put a price on love? If you are feeling loved up this Valentine’s Day, the Kurt Geiger London Lane Love sneaker is the one for you. Comprised of metallic multicoloured hearts embossed on a white leather shoe. These hearts really embody the holiday of love this year. Of course, these shoes are not for the faint hearted and should be worn with confidence to promote this laid-back silhouette. As one of the high streets go-to-brand for trend savvy designs, Kurt Geiger London has caught our eye with its contemporary revision on the everyday white trainer. If you are looking to upgrade your Valentines shoes this holiday, these could be your perfect match. We have provided you with five iconic Valentines shoes for her that we think are the best shoes you can buy for your special day. If you are spending the holiday alone, why don’t you spoil yourself with some Valentines shoes as it could be the perfect match! From clean traditional stan smith’s to eccentric Gucci Ace trainers, spoil your girlfriend this holiday and make it a day to remember as you can’t put a price tag on love. If you are looking for the most reliable courier service in which to deliver your trainers, make sure you look out for Parcel2Go.com, the cheapest courier delivery service. Alternatively, if you are looking to sell your trainers, get a quote today!